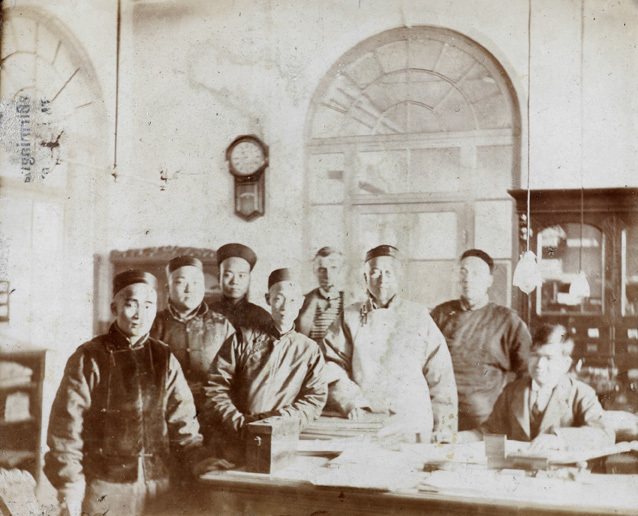 This week’s blog looks at the photographs of Reginald Hedgeland, an officer with the Chinese Maritime Customs Service. Throughout over thirty years of service across China, Hedgeland photographed the work of the Customs Service and his domestic and social life, giving an insight into the life of a Customs officer. Reginald Follett Codrington Hedgeland was born in Exeter, Devon on 18 December 1874. He joined the Chinese Maritime Customs Service in May 1898, having graduated from Pembroke College, Oxford, the previous year. Hedgeland was one of many foreigners from Europe and America who made up the higher levels of the Customs Service, which was controlled by central Chinese government. Originally established by foreign consuls to collect maritime taxes during the Taiping Rebellion in 1854, it expanded to include other functions such as domestic customs, postal services, and waterway and harbour management, and it was involved in politics and diplomacy. 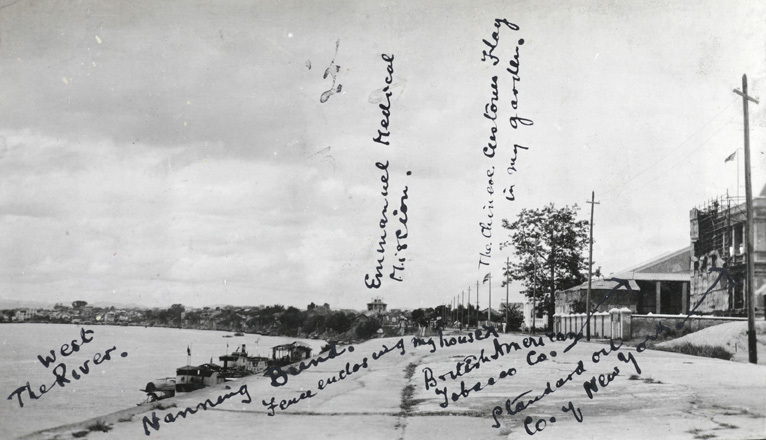 Hedgeland’s long career in China, which saw him retire with the rank of Commissioner in 1930, took him to many ports. His first posting was to Hoihow [Haikou], a port on the mouth of the Nandu River on the island of Hainan in the south. Later posts included Nanking [Nanjing], Tientsin [Tainjin], Macau, Hong Kong, Nanning, Aigun, Swatow [Shantou] and Canton [Guangzhou]. These varied postings are captured in the three photograph albums of his now held at SOAS Archives. The photographs show many aspects of Hedgeland’s daily life in China, including views of rooms in his houses and offices, of his colleagues and staff, and of his social life. Many of Hedgeland’s postings were to remote ports such as Nanning or Aigun, where the foreign social circles would have been confined and social opportunities limited. 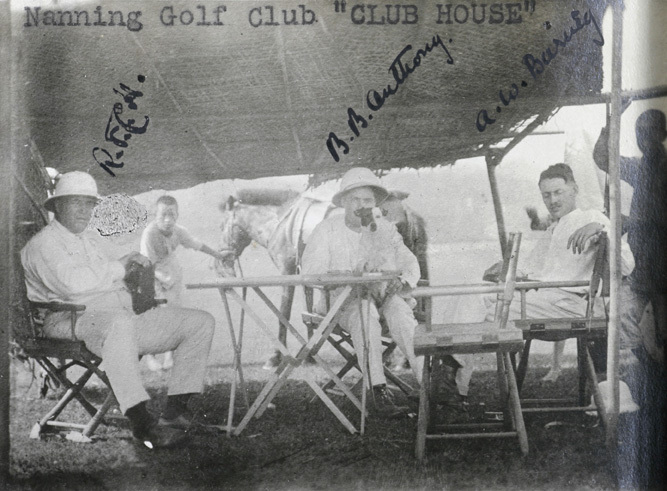 His photographs of the club house and golf course in Nanning show the somewhat improvised nature of the entertainment available there. Hedgeland’s archive documents an experience of the Customs Service far removed from the foreign experience of Shanghai, Hong Kong or Peking [Beijing]. It is likely that Hedgeland took some of the photographs himself, but it is also likely that he collected photographs taken by friends and colleagues as well as purchasing some from commercial photographers. In this respect the albums are similar to those of John Oswald, the subject of an earlier blog. The albums were compiled after Hedgeland returned to England in 1930. The time gap between the photographs being taken and the albums being compiled may explain some of the inconsistencies and contradictions in the photographs’ captions. 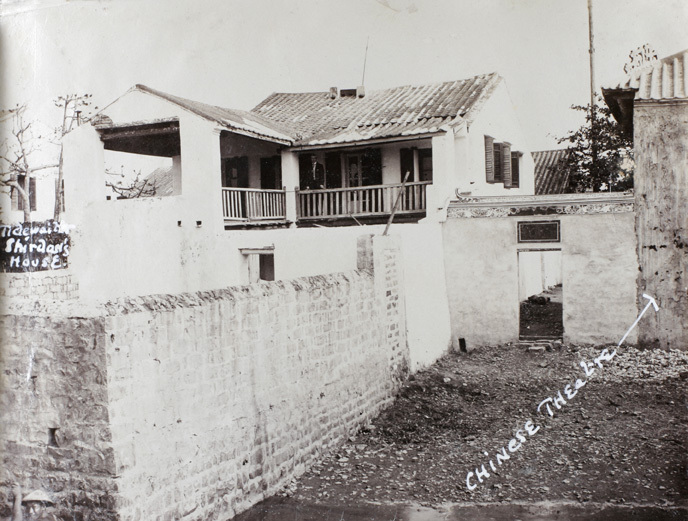 The building to the left is the house of T. Shirdan, tidewaiter (a customs official who boarded ships when they first arrived in port). To the right is a theatre. Schomberg & Co. was a merchant firm operating in Hoihow. Albert Otto (second from left) was employed at the firm. Hedgeland is seated second from right. The other guests are P.E. 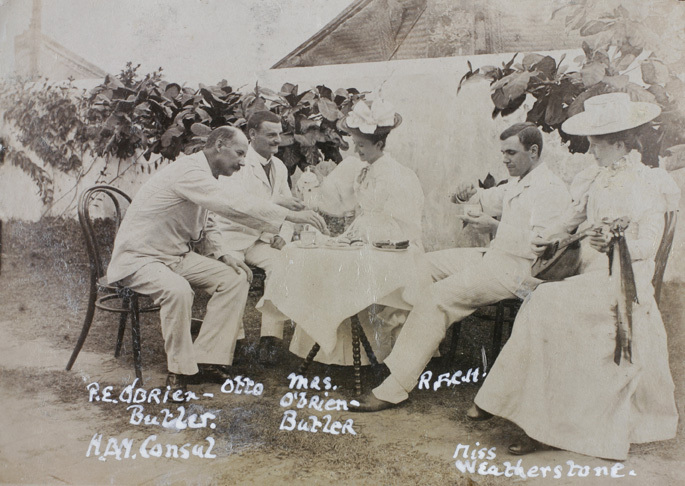 O’Brien-Butler (left), the British consul in Hoihow, and his wife (centre) and Miss Weatherstone (right). 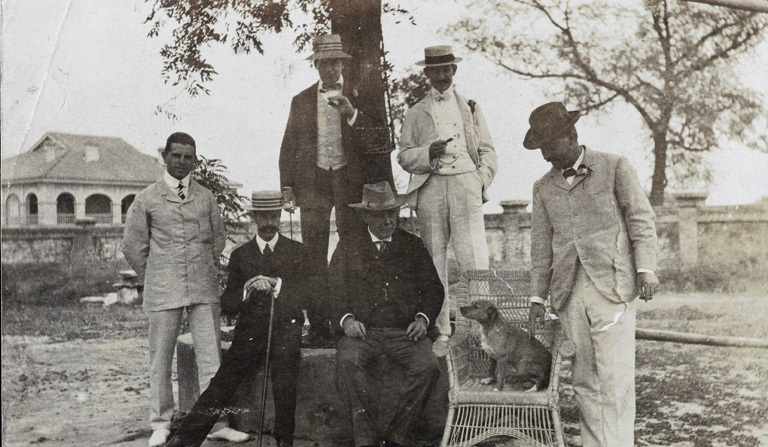 The group includes The photograph inlcudes H. Dawson-Gröne, W.R. Clouth, C.Thorne, W. McLeish and F.A. Aglen. Following the death of Sir Robert Hart in 1911, Aglen become inspector-general of the Customs Service. 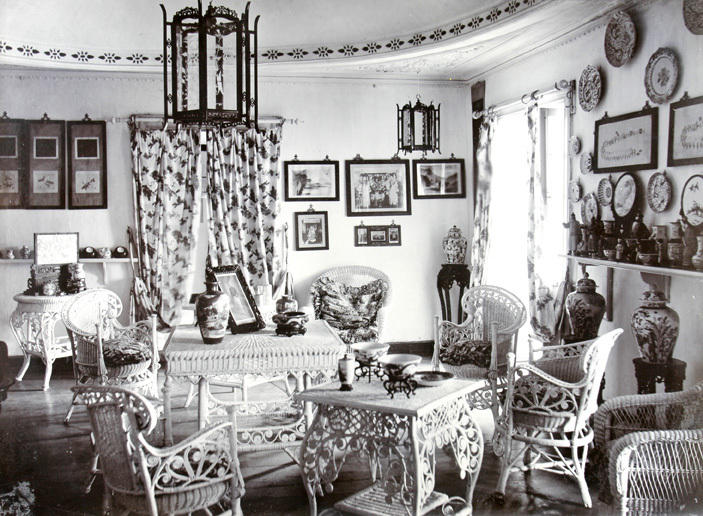 On the wall are photographs of the Dowager Empress Cixi, while on the table is a framed photograph that may be of Hedgeland’s brother, Arthur J. Hedgeland. The doorway behind the curtains leads to the dining room. Hedgeland is seated to the left. To his right are B.B. Anthony, of the Standard Oil Company, and A.W. Barney, a tidewaiter with the Customs service. The players used ponies to get around the course. The West River is to the left of the photograph, with the bund, or quay, in the centre. 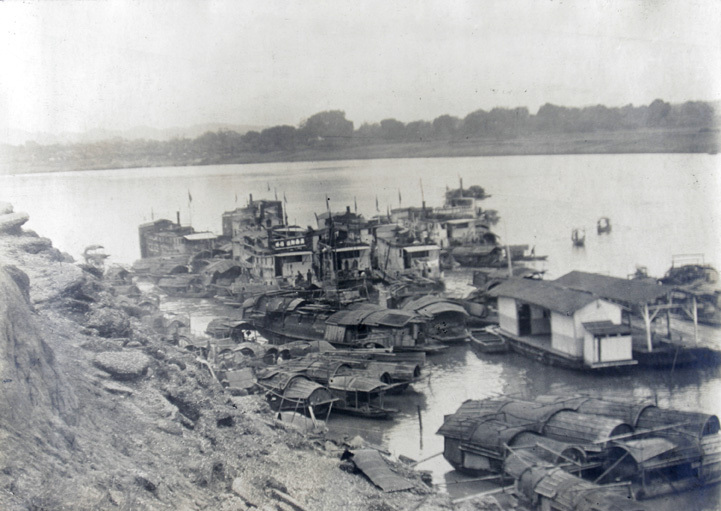 The bund collapsed into the river within a year of being built, and further collapses followed. The building at the far right is the Standard Oil Company office, with the British American Tobacco Company office to its left. These were the only two foreign companies to open in Nanning, but they left after a few years. Beyond the two American companies’ buildings the fence around Hedgeland’s house can be seen, with the flag of the Customs Service flying from a flagpole in his garden. 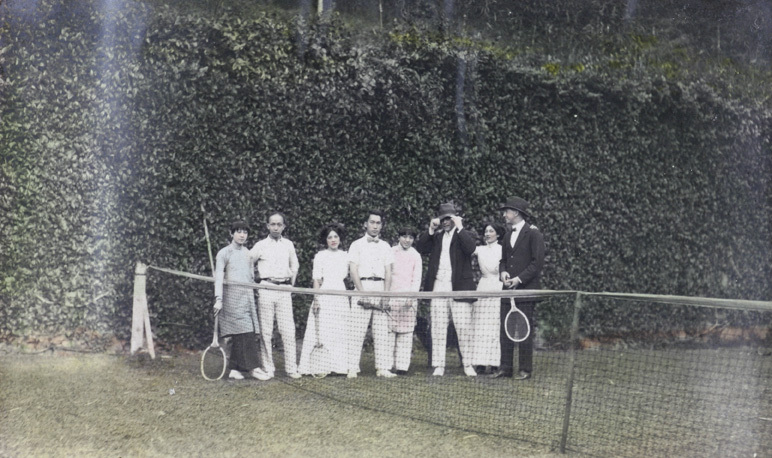 The tennis players include Wei Wing-Lox [Wei Wing-Lock], Sir William Shenton, ‘Annie’, ‘Aida’, ‘Rosie’ and two others. Wei Wing-Lock was educated at Hong Kong University and MIT. He captained the Chinese Davis Cup teams in 1924, 1927 and 1930. He died in New York, September 1935. Annie Ng Quinn was his wife. 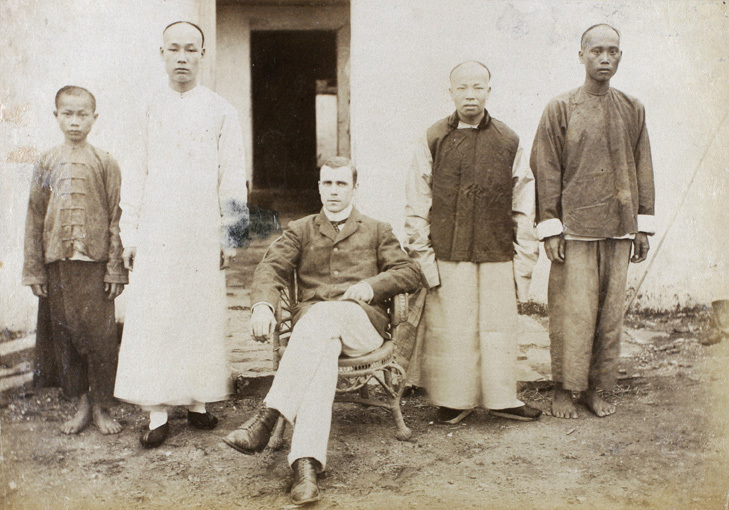 Sir William Shenton was a solicitor and head of the Deacons legal firm in Hong Kong. Further photographs from the Hedgeland collection can be viewed on Historical Photographs of China, alongside photographs of China from other SOAS Archive collections.